It's Nozomi's birthday, but it is disturbed by Bunbee chasing after a girl from another world, Chocola. 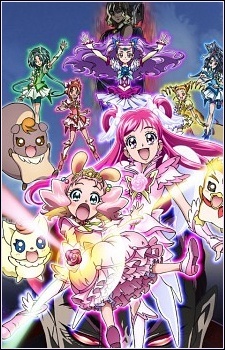 When Pretty Cure rescue her, she thanks them by taking them to her country, Dessert Kingdom. In this cockaigne with rivers of juice and candy growing on trees, they feel very comfortable. But then they meet the evil Mushiban and his two subordinates Dry and Bitter. They want to take over the kingdom and change Pretty Cure into sweets. In order to save not only Nozomi's Birthday but also the whole Dessert Kingdom, Pretty Cure have to fight their way against Dry and Bitter and also against their own friend: Coco, who is being brainwashed by Mushiban.